It’s the Food Fight Club final! 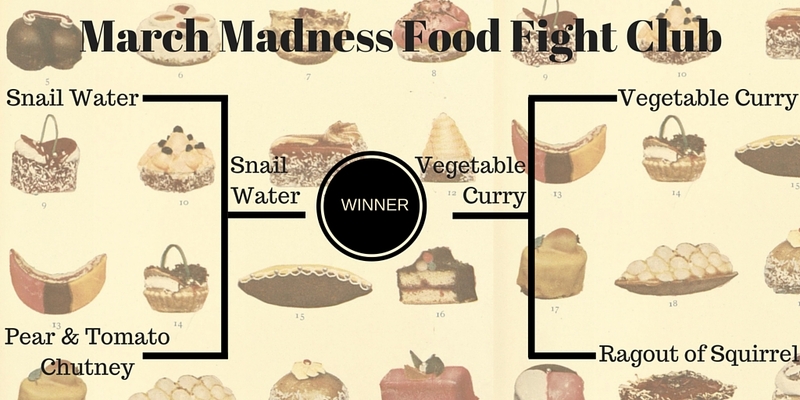 Snail Water won round 1 and Vegetable Curry won round 2. Now it’s time for these two tough competitors to duke it out once and for all. 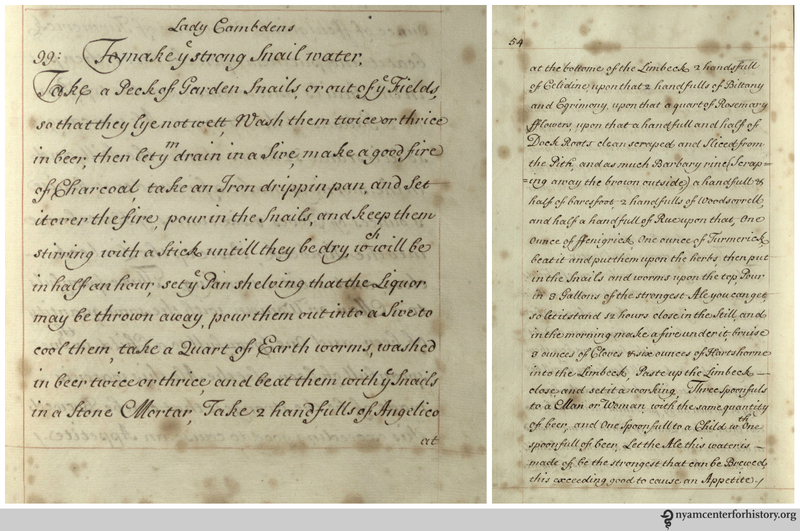 This final bout pits a recipe from a manuscript recipe collection against one found in a printed cookbook. From A Collection of Choise Receipts. Click to enlarge. The recipe for Snail Water comes from A Collection of Choise Receipts, one of 36 manuscript receipt books in our collection. These collections of recipes, dating from the late 17th through the 19th century, tell stories about the ways food was prepared in a range of households. In many cases, they incorporate source material from contemporary cookbooks in print, showing us the kinds of recipes households valued and relied on. These manuscripts often include personal information about the families who kept them. One noteworthy case in our collections is a recipe for “How to make coffy of dry swet aple snits (slices),” found in a recipe book kept by a German-American family in Pennsylvania-Dutch country between 1835 and 1850. Manuscript cookbooks can also show us the kinds of cooking technologies used by families. Repeated references to coals and the Dutch oven indicate that Pennsylvania-Dutch cookbook’s author was cooking at the open hearth. Publishers of printed cookbooks responded to demand from readers. These books—and the number of editions that were published—can tell us a great deal about cooking trends. 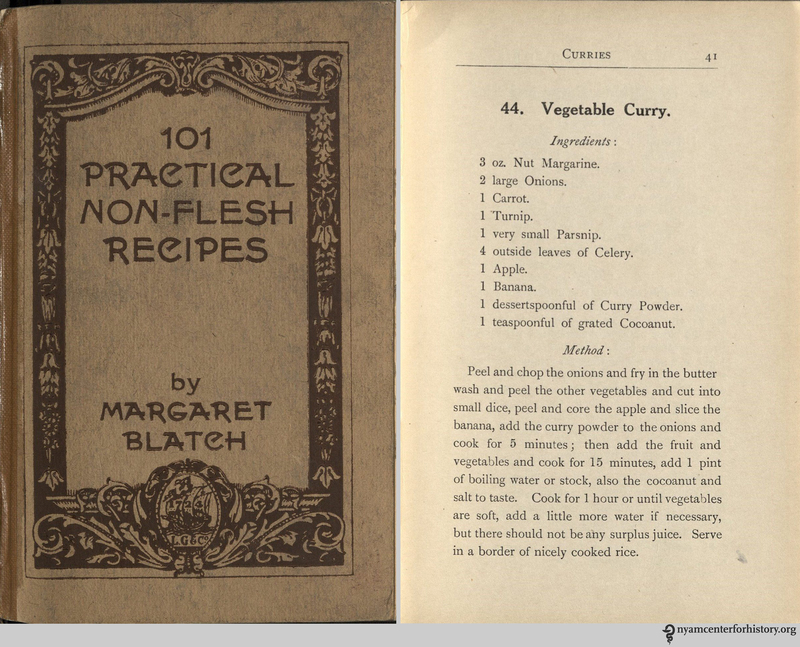 Our 1917 copy of 101 Practical Non-Flesh Recipes, for example, is the book’s second edition, the first published just a year before. Cookbooks could be aspirational, practical, or a combination of both. A 19th-century cookbook published in Milwaukee in German in multiple editions tell us that there was a demand for cookbooks written in the mother tongue for newly-arrived German immigrants. The mixture of German and American recipes in these books indicate a need for familiar recipes from the Old World, as well as instruction on how to prepare foods that were more typical of the New. A number of printed cookbooks in our collection have emended recipes or manuscript recipes laid-in to their pages, offering clues to how readers modified published recipes for personal use. Which recipe should be crowned the 2016 Food Fight Club Champion? Vote for your favorite—be it the most appealing, least appealing, or one that just tickles your fancy more—before 5 pm EST on Monday, March 28. With Hamilton-mania sweeping the nation, we’re not throwing away our shot to discuss the physician present at the infamous 1804 Hamilton-Burr duel, Dr. David Hosack. David Hosack. 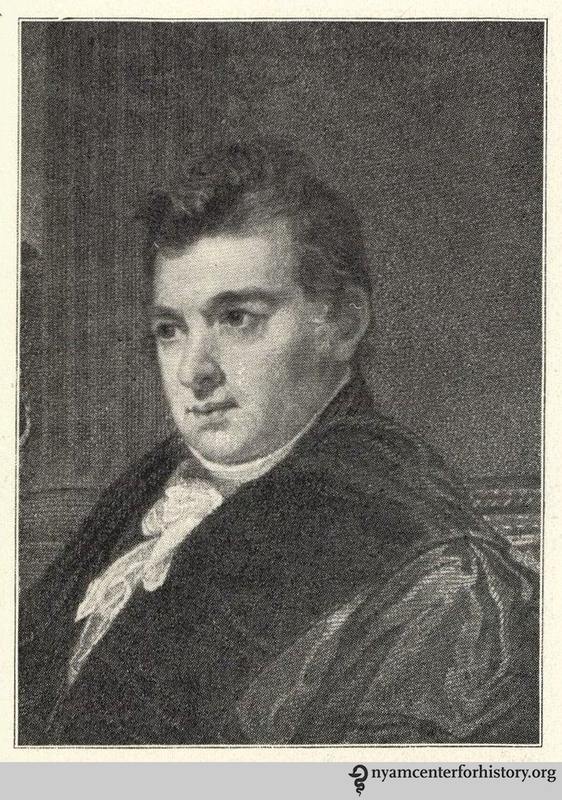 In: Eliot, Portraits of Noted Physicians of New York, 1750-1900. By 1794, Hosack had returned to New York City. He formed a medical practice with noted physician Samuel Bard and gained a reputation for the successful treatment of yellow fever.2 As his practice grew, he counted among his patients New York’s elite. 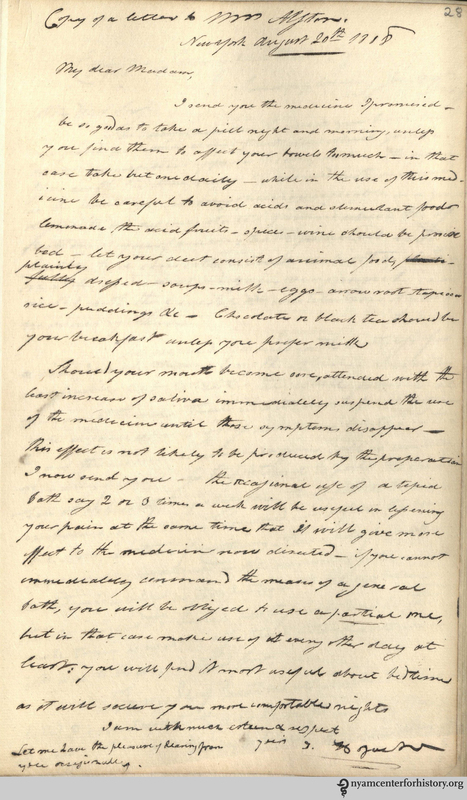 Not only did Hosack provide care for Hamilton and his family (including at the deathbeds of both Hamilton and his son, Philip, after their two deadly duels), he also served as physician to Aaron Burr and his daughter and close confidant, Theodosia Burr Alston.3 Our collection includes numerous manuscript materials from Hosack relating to his practice, including copies of a letter to Theodosia and one to her husband, Joseph Alston. These letters give a sense of Hosack’s warmth and dedication to his patients. 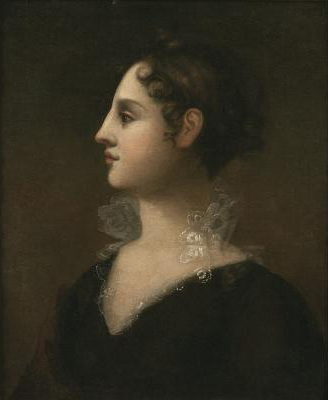 Theodosia Burr Alston, 1802. Portrait by John Vanderlyn. Courtesy of the New-York Historical Society. When she arrived she was much exhausted by the fatigue of her voyages—added to the diseases under which she labors—but by change of climate I hope she is likely to be benefited—her appetite tho still bad is somewhat improved—the pain on her right side and shoulder still continue troublesome, attended occasionally with violent spasms of the stomach and her other complaints, I mean those of the womb, remain as before—her general appearance is somewhat improved. My attentions hitherto have been directed to the general state of her health, when that is mended she will be enabled to make use of such remedies as are calculated to remove her local diseases—with the views of improving her strength. I have advised her to pass a few weeks at the Ballston Springs—she has already made some use of the waters and finds them to agree with her—but drinking them at the springs will be more serviceable to her—they are especially calculated to improve her appetite and strength, and in some instances have been found beneficial in obstructions both of the liver and womb which are her complaints—yesterday she left New York on her way to the springs—should any thing of importance occur and I receive information of it, you may expect again to her from me. 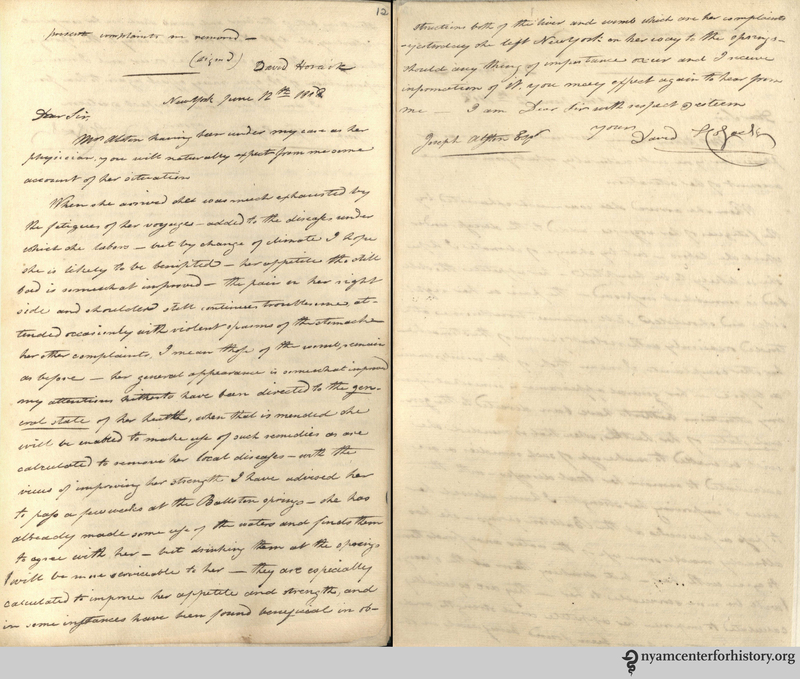 Recto and verso of a copy of David Hosack’s June 12, 1808 letter to Joseph Alston. In: D. Hosack. Copies of Letters and Documents, 1801-1826. Click to enlarge. David Hosack’s August 20, 1808 letter to Theodosia Burr Alston. In: D. Hosack. Copies of Letters and Documents, 1801-1826. Click to enlarge. Portion of page 59 of the January 12, 1913 New York Times. Click to enlarge. The Hosack name lives on at the Academy. In 1885, the estate of Celine B. Hosack, widow of Alexander, bequeathed $70,000 to the Academy for a new building or an auditorium within that building.8 The original Hosack Hall was on West 43rd Street, in the Academy’s home from 1890 until 1926. When the Academy moved to its current location in 1926, the new auditorium retained a name deeply embedded in American and medical history. Left: Hosack Hall on West 43rd Street. Image in Van Ingen, The New York Academy of Medicine: Its first hundred years, 1949. Right: Hosack Hall today, at 1216 Fifth Avenue. Click to enlarge. 1. Jeffe ER. Hamilton’s physician: David Hosack, Renaissance man of early New York. New-York J Am History. 2004;Spring(3):54–58. Available at: http://www.alexanderhamiltonexhibition.org/about/Jeffe – Hamiltoss Physician.pdf. Accessed January 15, 2016. 2. Hosack AE. A memoir of the late David Hosack. Lindsay & Blakiston; 1861. Available at: https://books.google.com/books?id=o4A22YJI53YC&pgis=1. Accessed January 19, 2016. 3. Garrison FH. David Hosack. Bull N Y Acad Med. 1925;1(5):i4–171. Available at: http://www.pubmedcentral.nih.gov/articlerender.fcgi?artid=2387360&tool=pmcentrez&rendertype=abstract. Accessed January 15, 2016. 4. James ET. Notable American Women, 1607-1950: A Biographical Dictionary, Volume 1. Cambridge: Harvard University Press; 1971. Available at: https://books.google.com/books?id=rVLOhGt1BX0C&pgis=1. Accessed January 19, 2016. 5. 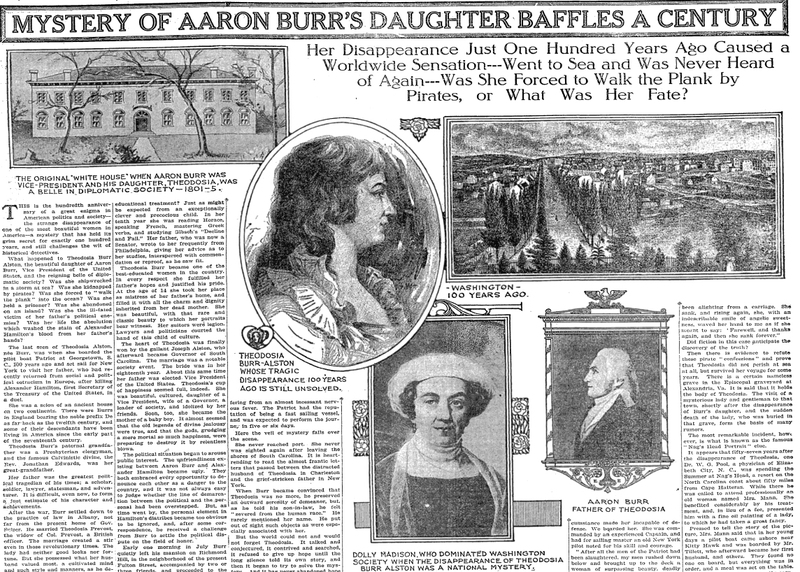 Mystery of Aaron Burr’s daughter baffles a century. New York Times. http://timesmachine.nytimes.com/timesmachine/1913/01/12/100604845.html?pageNumber=59. Published January 12, 1913. Accessed January 15, 2016. 6. Alexander Eddy Hosack, M.D. New York Times. http://timesmachine.nytimes.com/timesmachine/1871/03/07/78760572.html. Published March 7, 1871. Accessed January 15, 2016. 7. Obituaries. Med Surg Report. 1871;24(734):262. Available at: https://books.google.com/books?id=_kKgAAAAMAAJ&pgis=1. Accessed January 19, 2016. 8. Van Ingen P. The New York Academy of Medicine: Its first hundred years. New York: Columbia University Press; 1949. Ancient sources document the culinary excellence of one Marcus Gavius Apicius, a Roman gourmet who flourished during Tiberius’ reign (1st century CE). 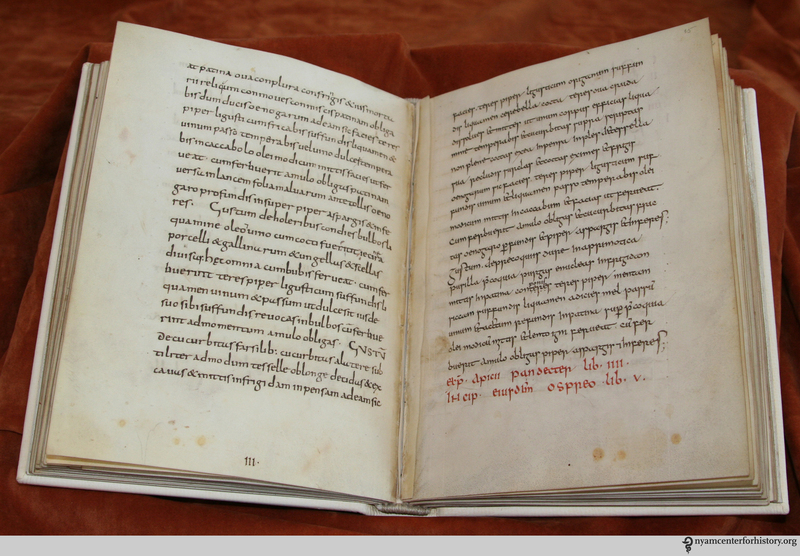 It isn’t clear from textual evidence that this Apicius ever wrote a book of cookery.1 And yet, the gem of our Library’s cookery collection—a 9th-century manuscript collection of Greek and Roman recipes—bears his name. 9th-century manuscript De re culininaria (sometimes De re coquinaria), attributed to Apicius. Click to enlarge. Our manuscript, transmitting a 4th– or 5th-century compendium of culinary and medical recipes compiled from a number of 2nd-century Roman sources, packs a powerful wow factor. It contains 500 Greek and Roman recipes from the Mediterranean basin. A handful may date as early as the 4th century BCE. As such, our manuscript is sometimes referred to as the oldest extant cookbook in the West. These recipes appear to be written by and for cooks. While some recipes called for cuts of meat that might have been beyond the means of the average Roman citizen, many others, including a number of meat, vegetable, and legume dishes, were well within the reach of Rome’s tradespeople, builders, artists, and modest farmers. Some of the recipes may have reflected popular dishes served in local popinae (street bars). A closer look at book one reveals a wide range of useful directives applicable for the Mediterranean home cook. Called Epimeles (careful, or attentive), book one includes recipes for a spiced wine surprise, honeyed wine, and Roman absinthe. Here too are tips for preserving pork and beef rind, fried fish, blackberries, and truffles. The dishes reflect the polyglot culture of the Mediterranean basin. The dominance of Greek culinary tradition in the early empire makes it likely that the Apicius began as a Greek collection of recipes, though mainly written in Latin, and adapted for a Roman palate.3 The cookbook incorporates a number of Greek terms, like melizomum (honey sauce) and hypotrimma (here a mixture of cheese and herbs), despite the existence of Latin glosses. Other words are hybrids of Greek and Latin, like tractogalatae, combining the Latin tractum (thin sheet of pastry) and gala, Greek for milk. The Apicius manuscript is the gem of the Academy’s Margaret Barclay Wilson Collection of Cookery, acquired in 1929. Conservators restored and rebound it in 2006. The gilt and illuminated Vatican manuscript of De re culininaria, as replicated in a 2013 facsimile. Click to enlarge. Images from both 9th-century iterations illustrate the different approaches to the text. The image above shows the gilt and illuminated Vatican manuscript, as replicated in a 2013 facsimile. Below is the Academy’s text. The number of cross-outs and the plain, unadorned style of the manuscript suggest it may have been a teaching tool for scribes. 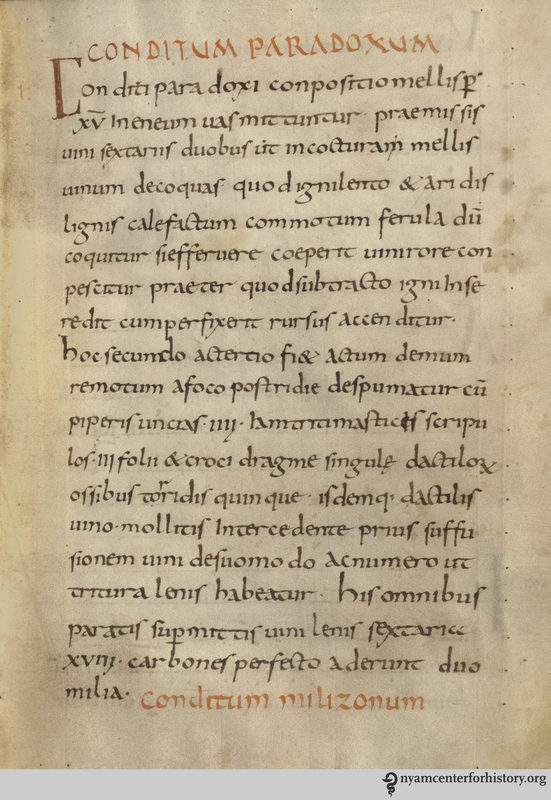 The Academy’s unadorned 9th-century manuscript of De re culininaria. Click to enlarge. Apicius has been a bestseller since the beginning of the print era, published in multiple editions since the 15th century. The Academy library holds many print editions, including two of the earliest. 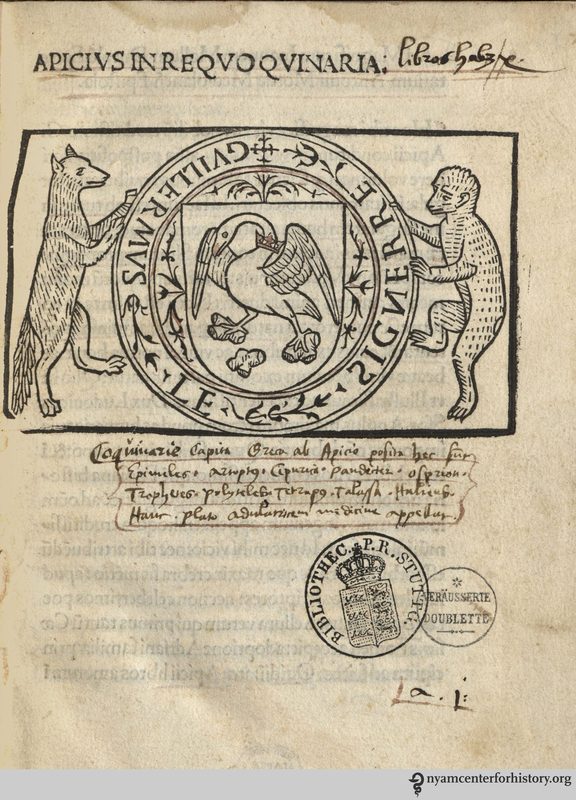 This title page is from the earliest dated edition of the text, published in Milan in 1498. Pictured below is the device of the printer, La Signerre, who later set up shop in Rouen. Our copy is annotated by an early reader who adds the titles of the text’s ten books, grouped by type of dish. Title page from the earliest dated edition of the De re culininaria, published in Milan in 1498. Click to enlarge. The second earliest dated edition, printed in Venice, offers one of the earliest examples of a title page in printing history. It too is heavily annotated by an early food-lover, fluent in Greek and Latin. 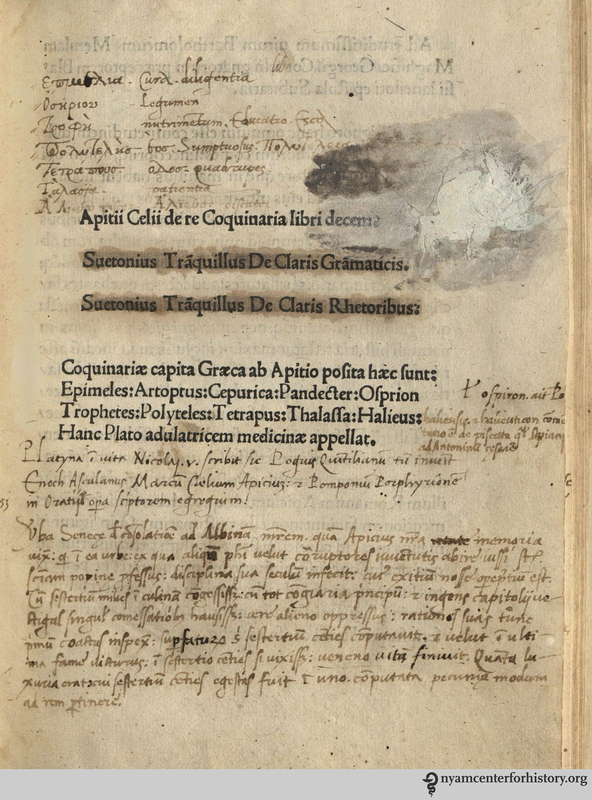 Marginalia in our 1503 printed Apicius offers Greek glosses on Latin terms. Enthusiasts will find many other print descendants of this extraordinary manuscript in the Academy’s library. The Apicius manuscript and a number of print editions of the text will be on display in the Academy Library’s Drs. Barry and Bobbi Coller Rare Book Reading Room during our October 17th festival, Eating through Time. A complete schedule of events can be found here. 1. Mayo, H. (2008). “New York Academy of Medicine MS1 and the textual tradition of Apicius”. In Coulson, F. T., & Grotans, A., eds., Classica et Beneventana: Essays Presented to Virginia Brown on the Occasion of her 65th Birthday. Turnhout: Brepols. pp. 111–135. 2. Christopher Grocock and Sally Grainger, eds. Apicius. A Critical Edition with an Introduction and an English Translation of the Latin Recipe Text Apicius. Devon: Prospect, 2006. p. 35. 3. Grockock and Grainger, p. 17-20. On Monday, The Recipes Project featured an interview with Curator Anne Garner about the print and manuscript historical recipe books in our collection. We’re delighted to republish the interview, conducted by Michelle DiMeo, on our blog. Could you give us an overview of the print and manuscript historical recipe books in NYAM’s collection? Can you offer any search tips for finding them in your catalog? At the heart of our culinary holdings is the Collection of Books on Foods and Cookery, presented to NYAM by Margaret Barclay Wilson in 1929. Wilson was professor of physiology and honorary librarian at Hunter College; she also advised the city of New York on food economy during wartime. The Wilson collection includes about 10,000 items, including the Apicius manuscript (see below), menus and pamphlets that demonstrate the way cookery changed over time, and a large collection of printed books, beginning in the 16th century. Included here are works by Scappi, Platina, and Carême as well as many other milestones in culinary printing. Especially exciting are the wide variety of everyday cookbooks we own that show what daily cooking was like in a range of households, across the world. Using our collections, you can also trace the changes that occur when people have access to new innovations—refrigeration, for example, or the gas range. 9th-century manuscript De re culininaria (sometimes De re coquinaria), attributed to Apicius. We have strong collections related to diet regimens and cooking for health, as well as cookbooks published during wartime when resources were scarce. More general texts on home economics and household management include much on cooking. Books on farming, viticulture and beer-making round out our strong print holdings. 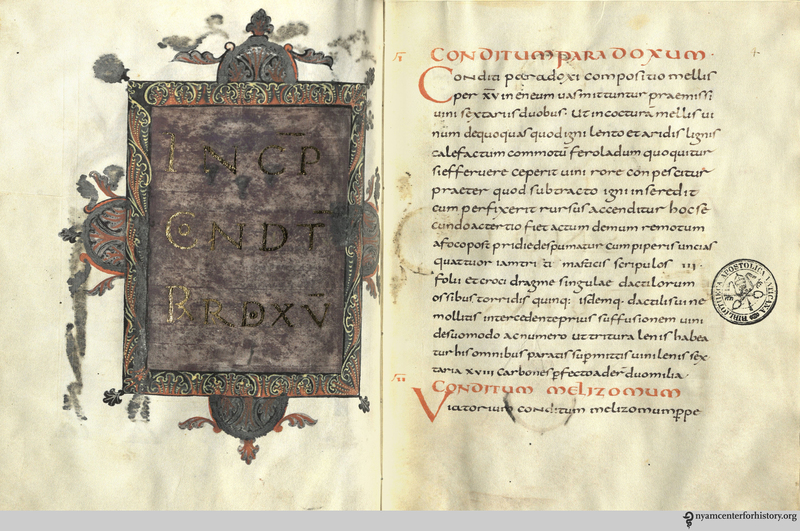 The centerpiece of our food manuscripts is Apicius’ De re culinaria, one of two existing copies of an early Roman cookbook mixed with medical recipes, agronomical observations, and house-keeping advice. Our copy was penned at the monastery at Fulda (Germany) around 830 AD. NYAM holds some significant early modern manuscript recipe books. Can you tell us more about these and give a couple of highlights? Our library holds 36 manuscript receipt books, dating from the late 17th through the 19th century. The bulk of the manuscripts are German and English. The remaining manuscripts are American, Austrian, French, and Dutch. 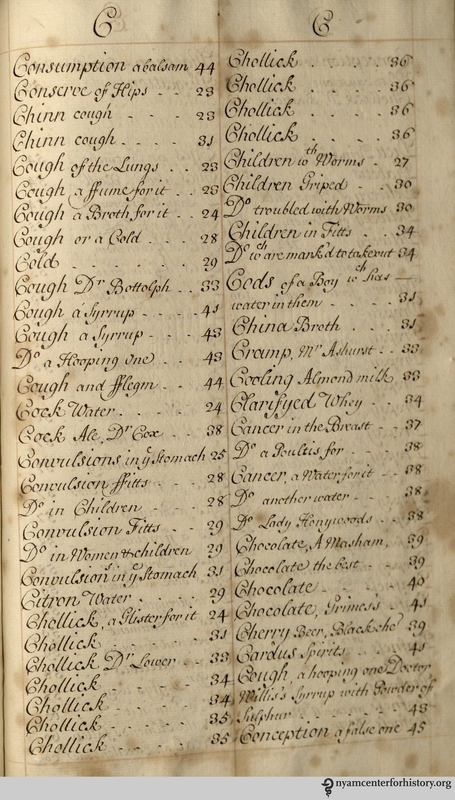 One of my favorites is the Choise Receipt book from 1680, which includes recipes for fruit preserves, baked goods, mead and beer, as well as hearty pudding and meat dishes. You’ll also find here a recipe ensuring a quick childbirth—central ingredient, baked eel livers!—as well as many other medical recipes. A tantalizing recipe for a “gam of cherries” is notable because the OED dates the earliest usage of “jam,” in any form, to 1736, almost sixty years after the date of this manuscript. Index of late 17th-century manuscript A Collection of Choise Receipts. 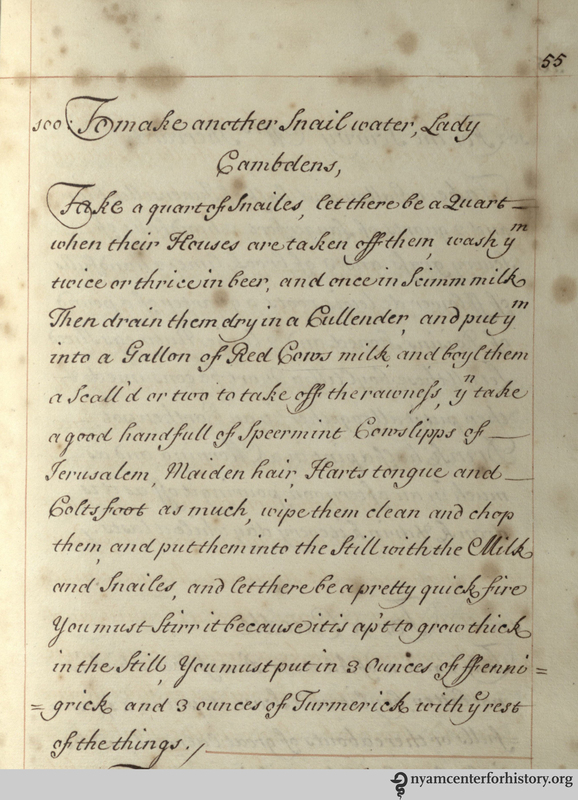 Elizabeth Duncombe’s manuscript offers recipes from a later period (1791). Food historian Stephen Schmidt has cooked several of these recipes, with delectable results! Highlights include a fish sauce more French than English in spirit (akin to today’s beurre blanc), and recipes for pigeon, hedgehog and potted mushrooms. References to milking and to cows suggest that this was the cookbook of a farm household, and not a city residence. Could you tell us a bit more about the Pine Tree Manuscript Receipt Book Project? The 36 early modern manuscripts described above were all in need of both conservation and cataloging. All items needed basic stabilization and dry cleaning; in some cases, the bindings needed to be replaced with historically and structurally suitable materials. All can now be used by the public without worry of further damage. They’ve also been cataloged, and can be found by searching online here. Both the conservation work and the cataloging was funded by the Pine Tree Foundation, overseen by Szilvia Szmuk-Tanenbaum. Szilvia is a bibliophile and a culinary enthusiast, and has been wonderfully generous to us. I heard that “Food” is NYAM’s 2015 programming theme. Do tell us more! How will recipes be included? We’re thrilled that our 2015 programming will focus on the history of food and food systems, working with historian and writer Evelyn Kim. Throughout the year there will be food-related events, culminating in our October Festival where we will offer a mixture of talks, demonstrations, and workshops, with noted chefs and writers. In April, we will also be participating in the Food Book Fair in Brooklyn. We will be drawing on our historical cookery collection for insights into changing ideas about food and health, nutrition, diets and more. Watch our blog for images, recipes and details of lectures and workshops to come. NYAM’s Center for the History of Medicine and Public Health (which includes the Library) hosts the blog Books, Health, and History. Could you give us an overview of some blog posts that were related to historical recipes? Food historian Stephen Schmidt did a wonderful post for us on a recipe for bread crumb gingerbread. The recipe can be found in a manuscript cookbook from the early 18th century but is adapted from a much older recipe for a contemporary audience. Schmidt writes about the evolution of gingerbread as a stomach settler in the 17th-century to its 18th-century incarnation as a sweet dessert cake, made with molasses. 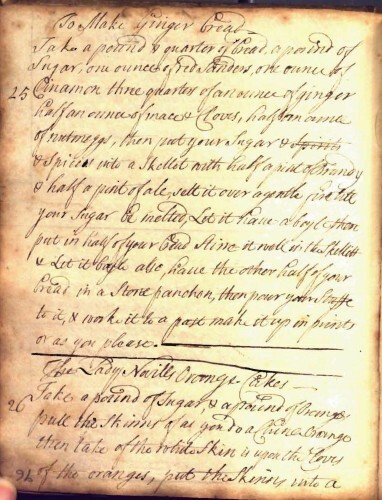 Our manuscript offers recipes for both the old and the new gingerbread. Schmidt speculates that the old was probably made at Christmastime, the new, in everyday cooking. Another highlight includes a blog featuring a staff member’s photo-documented chronicle of her experiences making Mother Eve’s Pudding, featured in this recipe book, and a post on the recipe itself, which is cleverly—and sometimes cryptically—told in verse. Other highlights include posts offering recipes for an authentic 1914 Thanksgiving dinner and on a pamphlet, the “Canape Parade,” featuring a procession of winsome vegetables. 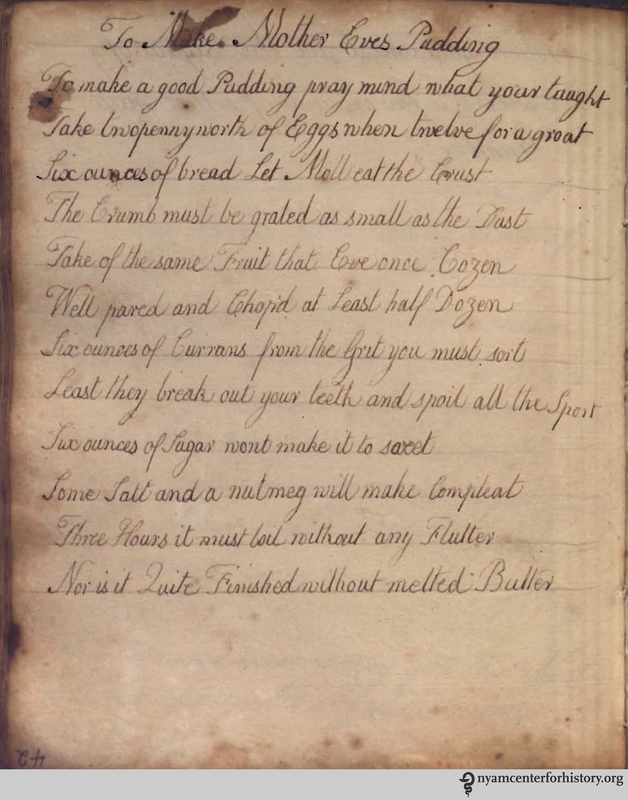 A recipe in verse for Mother Eve’s Pudding, late 18th-century. Lovell, M.S. The edible mollusks of Great Britain and Ireland, with recipes for cooking them. London: Reeve & Co, 1867. This Saturday, May 24, is Escargot Day. We are going to pass on the escargot and instead recognize the occasion by sharing a few medicinal receipts featuring our favorite gastropod. Fortunately for snails, we do not recommend trying the recipes. 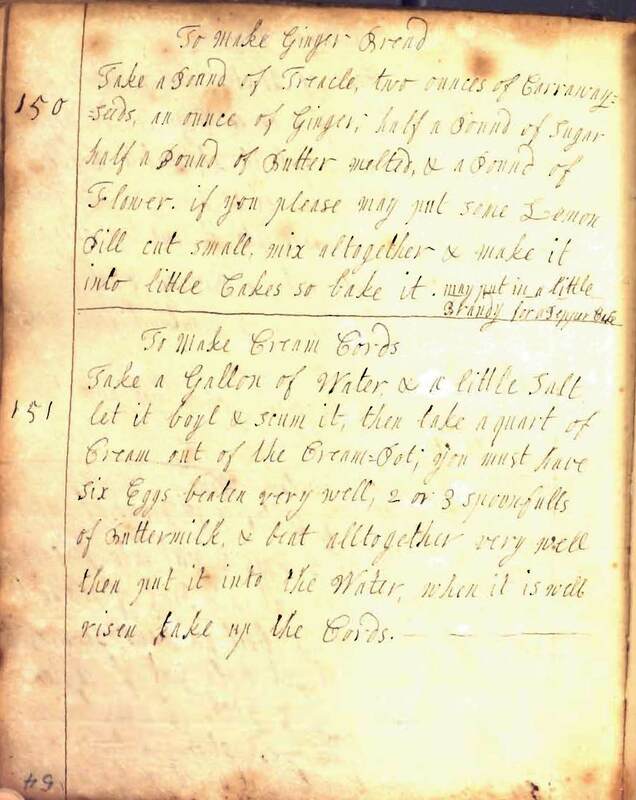 In 2013, the Center completed a project cataloging our manuscript receipt books; we came across preparations for “snail water” many times as we worked through the books. The three receipts below come from one of these manuscripts, A Collection of Choise Receipts, a late 17th-century English manuscript with exquisite penmanship, perhaps written by a professional scribe. As you can see, “sharpness in [the] blood” and appetite loss, strangely, can be added to the list of ailments snails were alleged to treat. You can look at additional receipts for snail water (and more) throughout the year by visiting us. 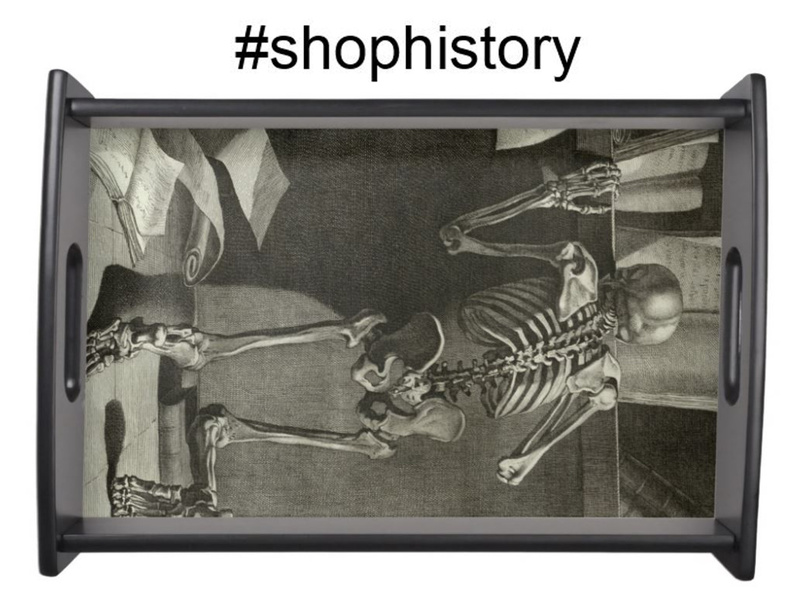 Email history@nyam.org if you are interested in consulting the collections. As a little tease, I left out the receipt for snail water with goose dung and sheep dung. 1. Hatfield, Gabrielle. (2004) Snail. In Encyclopedia of Folk Medicine: Old World and New World Traditions. Retrieved from http://books.google.com. Today we have a guest post written by Monica Green, a longtime NYAM researcher. Several times over the past 30 years, I’ve consulted a mid-13th-century manuscript in the New York Academy of Medicine’s holdings. This large, 94-leaf, handsomely bound volume was formative to my training as a historian of medieval medical history, having been the first “real” manuscript I examined when I was beginning my researches on the so-called Trotula texts in the early 1980s. Like most scholars who study the history of intellectual traditions, my eyes were on my immediate object of study—in this case, a 12th-century compendium of texts on women’s medicine and cosmetics. My peripheral vision went no further than the other texts on women’s medicine that surrounded it in the manuscript. These were certainly enthralling: they included one of only two known copies of the Gynecology of the 4th-century writer, Caelius Aurelianus. But the other contents of the manuscript, let alone its structure as a whole, were all but invisible to me. I did come back, many years later, with some questions about one of the surgical texts in the volume. This was the visually stunning (and rightly famous) Surgery of the early 11th-century Cordoban physician, Abu al-Qasim Khalaf ibn ‘Abbas al-Zahrawi, whose work had been translated from Arabic into Latin in Toledo. But the NYAM manuscript was not a unique copy (al-Zahrawi’s work exists in some 33 extant Latin manuscripts), and so—my questions quickly answered—I moved on again. But my attention was brought back to the NYAM volume again last year, because of some questions being raised by a new project. Two problems seemed to revolve around each other: why was there a 50-year gap between when the Arabic-into-Latin translator Gerard of Cremona died in 1187 (he was the one who had translated al-Zahrawi) and when his texts first started to be regularly used and cited? And, secondly, why did so many copies of these works, once they did appear, seem (a) to cluster around Paris and (b) show a level of magnificence in decoration that most medical texts had never previously enjoyed? Suddenly, the NYAM manuscript took on new significance: the illumination and decoration, which I had previously ignored, became newly important. And so, too, did the “minor” texts, such as the Surgery of Horses, of which this is likewise an early copy. 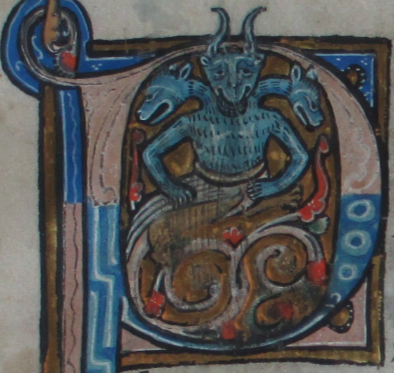 This really was a most unusual manuscript, I realized. And the physical character of the book—its structure and decoration as well as its contents—were key to figuring it out. So here I am this summer, back to consult it again. 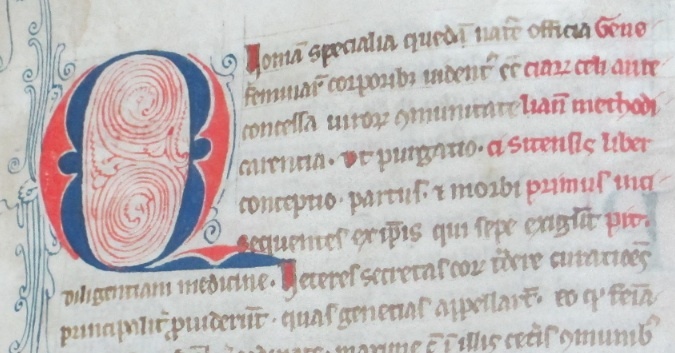 The gynecological unit, which I had worked with most extensively, was the most typical: the Trotula text, for example, opens with a lovely “puzzle” initial ‘U’, but there is nothing here to distinguish the manuscript from many hundreds of others made in the same period. 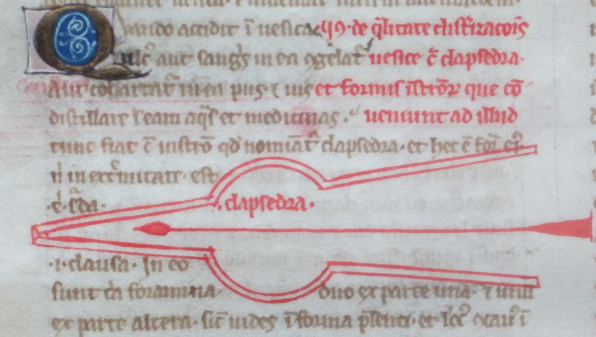 Not so for the surgical section of the manuscript. First was the cautery section: most of what must have been about two dozen images had been cut away (yes, they had art thieves already in the Middle Ages!). But the two images that remain show, in quite typical northern European style, images of a surgeon applying hot burning irons to the surface of the patient’s body in order to heal, respectively, sciatica and heart or stomach problems. Immediately following was a sequence of other surgical texts. Each one of them had a striking opening initial, framed in gold leaf with elegant foliated designs that are very similar to the output of an artist’s workshop in Paris associated with the name of the Johannes Grusch. The three-headed devil that opens the Surgery of Roger Frugardi is especially memorable. But in the middle of that sequence of smaller surgical texts (all of which probably came out of southern Italy) comes the al-Zahrawi text, with its own unique decoration scheme. Here we find throughout the text elegant gold-leaf initials, drawn against alternating light blue or rose-colored backgrounds with white ink filigree. (Art historians call this a “champie” decoration.) And, of course, here we find the depictions of surgical tools that characterize all the copies of al-Zahrawi’s surgical text, whether Latin or Arabic. The different decoration schemes seemed to correspond to different places from where the commissioner of this book was getting his exemplars (the manuscripts from which this manuscript was copied). So in what sense does being in a digital age give us “new eyes”? I had the physical manuscript right in front of me: 800 years of history that I could touch with my hands. Nothing “virtual” about this! Ah, but the New York Academy of Medicine was not this book’s original home. Because so many European libraries are now making their manuscripts available digitally online, it is possible to reconstruct virtually what medieval libraries looked like, to reassemble their components and reconstruct how they came into being. Because I could learn more about other manuscripts produced at the same time, I was now beginning to understand how extraordinary this manuscript’s medieval home had been. 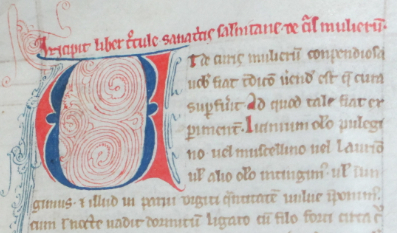 The NYAM manuscript was commissioned in the mid-13th century by Richard de Fournival, a surgeon and, eventually, the chancellor of the cathedral of Amiens. (de Fournival had gotten special dispensation from the Pope to continue his surgical practice despite his being a cleric. His father and nephew were physicians, too.) The NYAM manuscript captures all the international networks that de Fournival belonged to: English, Norman, French, and Italian. Besides being a cleric and a surgeon (and a poet and musician), de Fournival was a librarian—not simply a collector but a curator of books. The library he created of 162 volumes (comprising many 100s of different texts) literally changed the course of history in laying the foundation for a new, more sophisticated medical system in Europe that was as influential in establishing the social worlds of physicians and other medical practitioners as it was in defining their intellectual worlds. It was de Fournival, I was realizing, that was instrumental in rediscovering Gerard of Cremona’s translations (including al-Zahrawi’s Surgery) and introducing them into the fertile context of the Parisian academic world. In our day, Google and PubMed and any number of Internet resources make us lose sight of where knowledge comes from. Everything seems freely available, whenever we want it. But books were once extraordinarily precious. Juxtaposing the digital with the real vellum and leather and wood and gold leaf of a medieval manuscript is an excellent reminder of the cultures of learning we still share across the centuries. Monica H. Green is a specialist in medieval medical history and the global history of health. She would like to thank Alison Stones for the impetus to bring “new eyes” to the NYAM manuscript, and Jocelyn Wogan-Browne for making this New York sojourn possible. And, of course, the NYAM librarians for once again making the manuscript available for study. Green will be spending the 2013-14 academic year at the Institute for Advanced Study in Princeton. She can be reached at monica.green@asu.edu. To celebrate National Poetry Month, we are sharing a poem from our collection each week during April. With the support of the Pine Tree Foundation of New York, we are currently cataloging our manuscript recipe collection, which is the source of our first poem. The rhyming recipe was in both English and American cookbooks through the end of the nineteenth century, but this particular version is most likely from the last quarter of the eighteenth century. Food historian Stephen Schmidt wrote today’s post, which includes findings from research he conducted at NYAM last summer. The post was originally posted on the Recipes Project blog. Recipe book England 18th century.